Hi everyone! Thank you to those who joined in the Printmaking Unleashed LIVE preview event. It was great to have so many of you participate from around the world! After a little hiccup with the Ustream producer software, I was online a little over an hour..so much fun chatting with you. In case you missed it or just want to watch it again...I've edited the videos into eight segments to make it easier to watch. PLUS I've included a bonus technique video that shows how I paint with Tyvec stencil resists to create colorful acrylic skins. During the LIVE preview event, I shared an overview of the workshop series, talked about found tools, mixed media backgrounds, showcased a few of the handmade tools you'll see in the workshop videos and answered questions. The FREE rebroadcast will only be available until Sunday, August 31 at 12pm noon. After that the only way to watch the rebroadcast will be in the Printmaking Unleashed LIVE classroom. There is still time to register, I've extended the pre-sale until August 31! CLICK HERE to watch the REBROADCAST! Join me for a FREE preview event Printmaking Unleashed LIVE. I'll be streaming live from my studio to answer questions about the upcoming e-course series. the LIVE event has ended. thanks to everyone who participated. I will post the replay on the blog next week. The FREE LIVE event has limited seating, click on the link above to register and to watch on Wednesday, August 20. If you want to participate and ask questions during the live event, you must create a FREE Ustream account. Don't worry if you can't make it or the live event is full, I will share a replay on my blog and in the classroom. 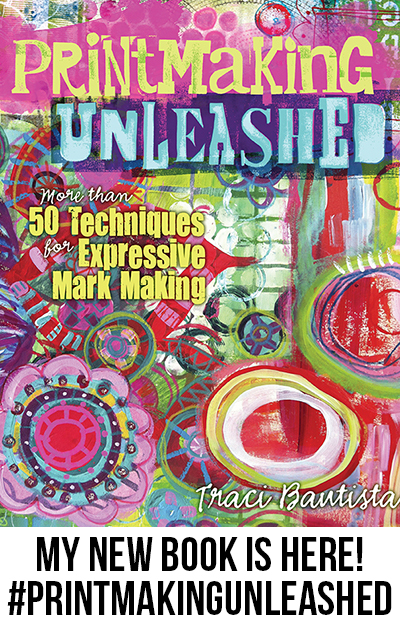 join me for my new mixed media e-course series..learn more in-depth printmaking techniques---> Printmaking Unleashed LIVE! Pre-sale price is available until 8/22/14. class starts September 1, 2014!! I look forward to seeing you online!! Today I have a special guest post from my artsy pal, Carissa Paige. 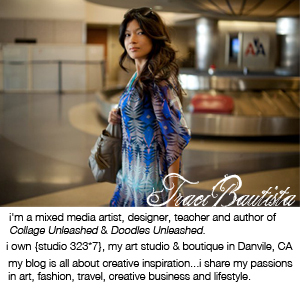 She's a sweet, creative soul and creates truly inspiring mixed media artwork. 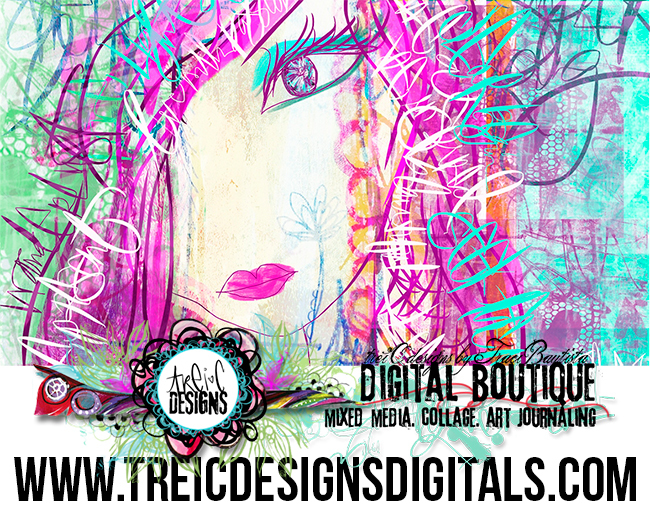 You will LOVE her colorful, expressive paintings and the soulful girls that grace her canvases and art journal pages. I'm honored to have her share with you a few of her Printmaking Unleashed experiments. Carissa used products from my Printmaking Unleashed Ultimate Collection kit and created a mix of printmaking pieces, a painted collage canvas, art journal pages with digital artwork...so FAB!! here's a video of her printmaking projects + watch a digital mash-up of her printed papers mixed with drawing on the iPad unfold..
Hello Dear + Creative Hearts! Digital Photography Stencils (page 72) – I had a wonderful encounter with a Monarch Butterfly earlier this year. Butterflies have been a recurring theme and symbol in my life, so to create a stencil of him was pure joy. I used him as a resist on my printing plate, and as a stencil on various papers. My mind was whirling with ideas for future layers and stencils. Free-Motion Stitched Foam Stamps (page 12) – I absolutely love this idea! I had a little snafu with my sewing machine though (the needle wants to be replaced), so I improvised with just foam stamps / shapes in the meantime. I stamped these onto my printing plate and pulled various prints, layering until I felt happy, and then snipped out my favorite bits to use in paintings. Color Palettes (page 59) – Huge inspiration! I love gathering colors and patterns from various imagery and creating pallettes. What a powerful tool - especially if you aren’t feeling inspired. How about you? Are you feeling inspired? Ready to Unleash? Intuitive Voyager. Artist. Writer. Teacher. Magician. head on over to Carissa's blog for a chance to win a copy of Printmaking Unleashed! THANK YOU Carissa for your wonderful interpretation of my book techniques..LOVE all the art! Buy a copy of Printmaking Unleashed on Amazon. Buy a signed copy of Printmaking Unleashed + printmaking goodie box. And the Printmaking Unleashed celebration continues...I sent out my book and a collection of printmaking tools with some of my FAVE art supplies to a few of my artist friends and I'm blown away at their amazing creations inspired by techniques in my book. I'll be sharing their amazing posts with you over the next few months. This week check out all the colorful, textured, juicy artwork and giveaways. a simple piece of cardboard can create such striking and organic marks, like the series of prints Jane Davies created...visit her blog to see the beautiful prints and enter to win a Printmaking Unleashed book kit + supply giveaway! oh how I LOVE LOVE all the stitched texture printing experiments that Tammy of Daisy Yellow shared on her blog this week..check out all the messy printing plates and textures. Roben-Marie started with creating colorful fusion dyed collage skins then made a beautiful art journal I adore! check out Roben-Marie's project PLUS enter to win this wonderful art journal! Head on over the Seth's inspirational blog to read his review on my book! Hope you are as INSPIRED as I am by these artists and their lovely creations! I love how they have been inspired by techniques from the book and transformed them to make it their own. If you have posted about Printmaking Unleashed or done a book review, I'd love to see it. 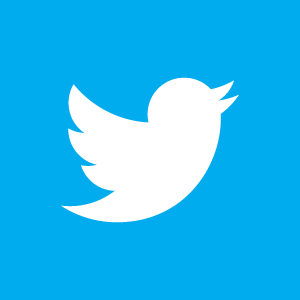 Please email me links to your posts so I can share them. Don't forget to head over to their blogs and enter the giveaways. Hi there! I've been out of the studio the past couple of weeks...just getting back in the swing of things and catching up. I took a trip to visit the fam in Hawaii and spent the week with my nieces indulging in various art related activities, celebrating birthdays and lounging at Lanikai Beach. Then I headed straight to teach two workshops at Art Unraveled in Phoenix...more about those two trips in later posts. Sending a huge THANK YOU to everyone who joined in the creative journey! It's been great to see all your colorful artwork! I've been asked by a few people if I'll do another challenge. I'm thinking about putting together more fun mixed media prompts later this year. p.s. join me for my new mixed media e-course series..learn more in-depth printmaking techniques---> Printmaking Unleashed LIVE! I will be hosting a FREE live streaming preview event Wednesday, August 20. Pre-sale prices is available until 8/22/14. For more details + watch a video preview visit printmaking unleashed LIVE e-course info.